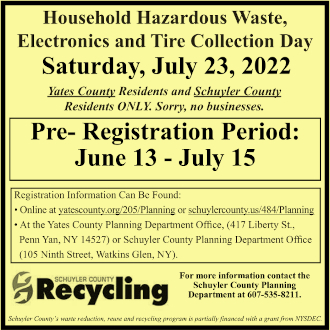 SCHUYLER COUNTY—Had enough water this summer? Farmers, garderners and many vacationers may have lamented one of the dreariest summers in memory, but at least some boaters were undaunted by the weather. “Out of the whole month of June, I think it rained 27 days out of 30,” says Bob Ervay. He is the owner of Ervay’s Marine, 1.5 miles up the Canal on Fairgrounds Lane in Watkins Glen, and is looking back at a so-so summer, slightly better than last year, though definitely not one of the better years. “We were busy, sold a lot of gas, did a lot of service,” he sums it up. “The boat market was fair, compared to some other years. I think the other dealers feel the same way.” Ervay sells boats on consignment, and notes that those selling are often trading up to a larger boat or departing entirely from boating, for reasons having nothing to do with personal finance. Don Roberts, owner of the Glen Harbor Marina, confirms most dedicated boaters don’t experience the financial pinch in the same way as the rest of us. Sure, they may have suffered from investment losses – though many might also be economically better insulated than others from a personal economic meltdown. But that’s apparently not the issue, where boating is concerned. “Even in bad economic times, they’re not ready to give up the boating,” Roberts says. “Boating is at the bottom of the list, maybe they’ll give up something else.” Small boat sales were down in 2008, he reports, though things have picked up a bit this year. Ervay says he thinks canal usage was down a bit this year, with many boaters opting for shorter trips, or simply going out onto the lake and enjoying being in their boats without going far. But Terry Stewart, Dock Master for the Village Marina and operator of Seneca Sailing Adventures, said he’s already taken out 125 sailing charters this season. Further, he says, he’s seen many in the community of serious live-aboard boaters, who discover all the amenities within walking distance of the boat slips, then extend their visit to enjoy more of Watkins Glen. 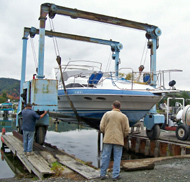 Gregg Bittler, owner of Anchor Inn and Marina on Salt Point Road in Watkins Glen, has fleet of boats available to rent to those who decide they want to experience the area from the lake after they arrive here. He says that although he’d count 2009 as an off-year, he’s also seen a slight increase in rental boats this year. “It was an off-year because the weather was so unusually cool and wet,” he says, then recalls a wedding he arranged for clients that took place this summer entirely on boats.